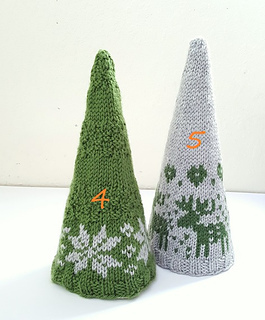 The cable trees, Trees 1, 2, 3, are the same in both patterns. 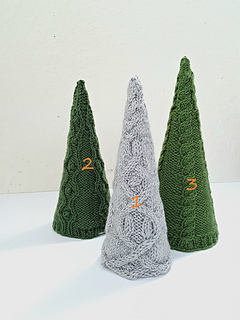 5 designs of simple Christmas Trees: 3 in cables, and 2 in stranded colorwork. 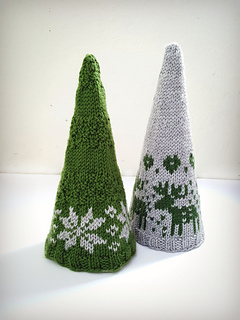 Illustrated instruction of Paper Cone Stand included in pattern. Sizes approximate Base Circumference x Height. 20 sts x 26 rows = 4” x 4” / 10 x 10 cm in stockinette stitch after blocking. 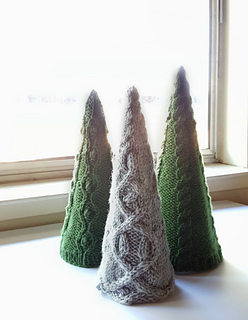 Construction Each tree is worked in round from bottom up. Written instruction for each chart.